What type of photography inspires you? I think there should be a photography club as lots of people are really interested in photography. Photography is a great hobby which can turn into a career. Photography allows you to capture special moments in time so you can look back and remember what happened. Digital cameras give you the chance to delete pictures that aren’t what you want, traditional film and disposable camera’s don’t give you that option. 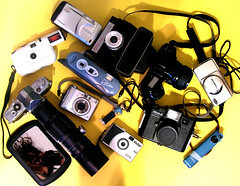 Disposable cameras are great for 6-8 year olds, but they are not appropriate for older children and adults. Digital camera’s capture light really enable you to edit the photos. The iPads will enable us all to take and edit photographs so there are no resource problems. You can put photos on lots of things, e.g-mugs, computer mats, on the fridge, in frames, on pillows, on key rings, clocks………… You can go to a supermarket or computer shop and print off photos/get a picture printed onto something really easily and cheaply. If we had a photography club at school it would give children the chance learn how to use camera’ s properly. This would be especially good for children who don’t have assess to a camera at home. You can do all sorts of photography, still life, wedding photography, wild life photography………… There is a type of photography for everyone. With the iPads we will all be able to take photographs but taking good photographs is a real skill. ameliadavis - who has written 1 posts on Harrogate Grammar.